MANILA, Philippines — A new addition to Quezon City’s vibrant commercial and leisure circles is now open to cater to a growing group of business travelers and visitors, as the new Prime Hotel at 70 Sgt. Esguerra Street recently launched. 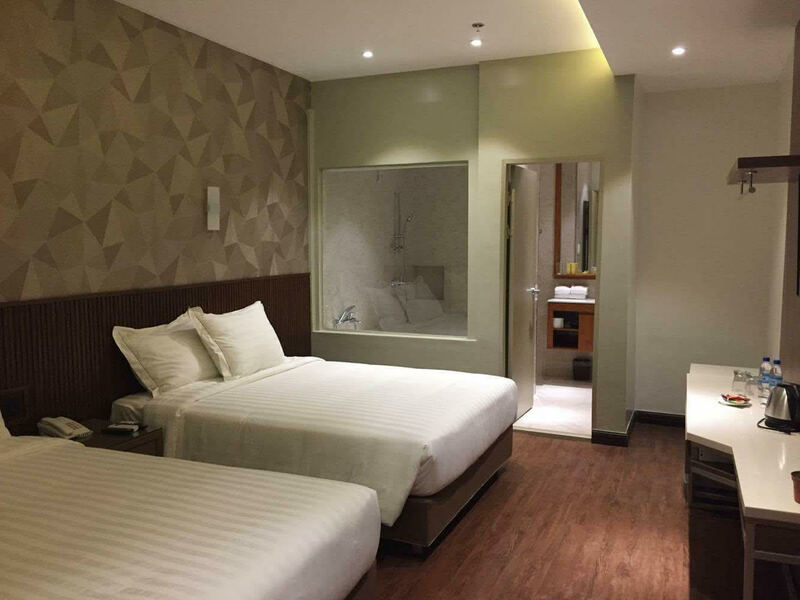 Prime Hotel is located near EDSA, walking distance to the MRT Quezon Ave Station, walking distance from ABS-CBN, ETON and Vertis North. 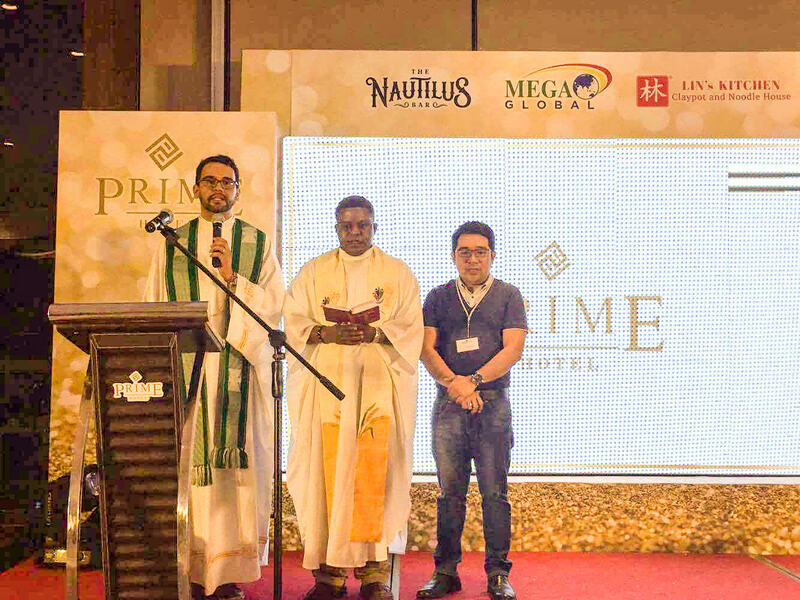 Prime Hotel aims to cater to the city’s local and foreign visitors. The new hotel boasts of its ballrooms that can be used as venues for all occasions. Among these is the Grand Ballroom that features an elegant design, high-ceiling, and wide space, suited for formal gatherings or big business conferences or large wedding celebrations. For banquet dinners, it can accommodate up to 200 persons and can be extended to fit up to 250. There are also two other ballrooms that can accommodate 100 persons and 70 persons, respectively. These halls are also perfect venues for smaller business meetings, as well as for hosting banquets or activities for smaller groups. All function rooms comes with state of the art audio visual equipment. For smaller events, Prime Hotel also has several function rooms to choose from that can be utilized for photo shoots and other more intimate activities. Meanwhile, the 39 hotel rooms offer patrons several sizes to choose from. The room sizes range from 12sqm to 15sqm for the Traveler’s room to a spacious 38sqm floor area for the Two-Bedroom suite. For those who need a more convenient space for themselves or their families, Prime Hotel also has other rooms, such as the Superior and De Luxe, as well as the Premium and the Presidential suite. All of these rooms and suites are appointed, beautifully, with the most modern furniture, fixtures, and amenities with the guests’ comfort and relaxation in mind. 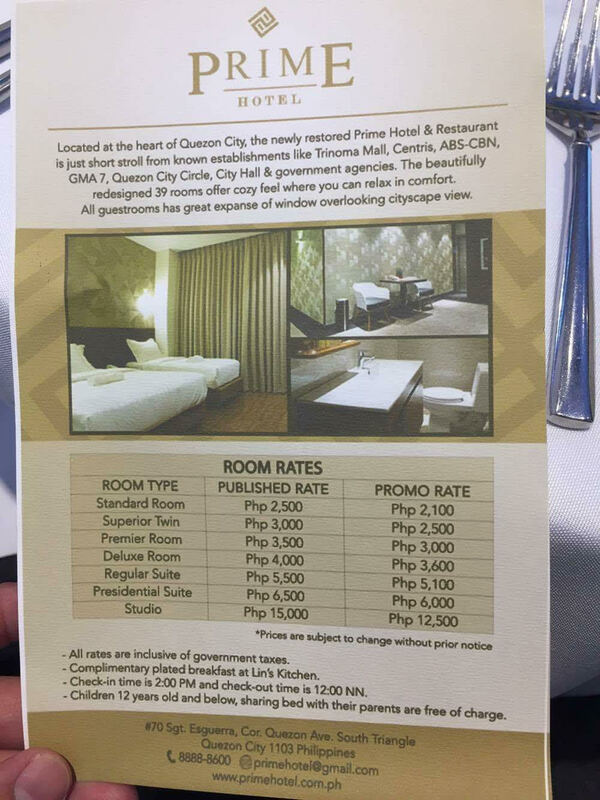 Moreover, the rooms are affordably priced starting at PhP2,500.00 per night for the Traveler’s room; to PhP3,000.00 per night for the Superior room; PhP4,000.00 per night for the De Luxe room; PhP5,500.00 per night for the Premium Suite; PhP6,500.00 per night for the Presidential Suite; and PhP15,000.00 per night for the Two-Bedroom Suite. Finally, aside from the well-appointed rooms, guests can also avail of the hotel’s several amenities. After having their meetings and events, the hotel offers these other features to help them relax and unwind, like the Nautilus Rooftop Whisky Bar – with one of the best designed bars in the Metro, KTV room ,a fitness center and the first hotel in the Philippines with a Game Room that offers Virtual Reality or Augmented Reality for guests. To know more about the Prime Hotel, as well as for inquiries and reservations, please visit their official Facebook page (@primehotelph), visit their website at www.primehotel.com.ph or call 962-8000.